Our exclusive line of reedstem Epidendrum hybrids are offered. 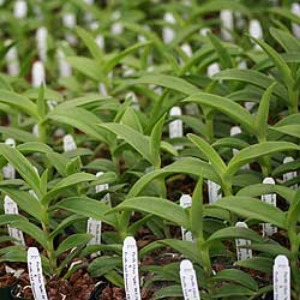 New seedlings are produced from years of breeding at Cal-Orhid. You can expect very large flowers held in clusters in a wide variety of colors. Reedstem Epidendrum hybrids have been grown for more than 100 years. The very first hybrid, Epi. O'brienianum (radicans X ibaguense) was made by the famous English grower, Harry Veitch, in 1888. As a side-story, this particular hybrid has recently gained some notoriety as it has been listed as a nuisance plant, bordering on noxious weed status in N. Australia and Hawaii because because, after extensive landscape use, it has actually naturalized to the extent of being invasive! Anyway, suffice to say, many years passed, and new progress was made in epidendrum breeding. A huge advance was made in 1953 by Ernest Iwanaga of Hawaii with the creation of Epi. Orange Glow. With this cross, he introduced a completely new type by using Epi. cinnabarinum, which greatly increased the size of the flowers and a more upright growing habit. Unfortunately, many of these new hybrids were considered just garden plants and so did not carry registered names. The plants were spectacular and beautiful specimens however, and could be seen in many of the gardens in Honolulu. One disadvantage for some growers was their very large size, with canes up to four feet tall. Later, new and striking hybrids were created such as Epi. Joseph Lii and Hokulea. These exhibited the most brilliant red color unseen before. Hawaii has continued to produce some new epidendrum hybrids, but unfortunately, they are very tall, cannot take the cooler temperatures, and often lack real names. Because of this, these hybrids may have never gained the popularity that they deserved. During a trip to Japan in 1996, I was pleasantly surprised to see epidendrum hybrids making a return to horticultural significance. They were being grown on a large scale, as flowering potted plants. There were a modest number of smaller growers who were hybridizing a new line of epidendrums. These new plants were much more compact because of the use of very compact forms of Epidendrum secundum was used as a parent. The flowers were relatively small due to this, but they exhibited very large heads of flowers. The most successful breeder was Mr. Inamine of Miura Valley. He was very kind to me and allowed me to purchase a few plants. These, together with a few plants from Hawaii were the foundation of our own breeding program here at Cal-Orchid. For almost twenty years, we have worked very hard to develop a unique line of epidendrum hybrids; distinctly different than the ones seen in Japan. In the beginning, a very small color range, mostly orange, was the first hurdle to overcome, Over the years, we have been able to produce plants in a very wide range of exciting colors recently focusing on the 'watermelon pink' tones. We also put considerable effort towards increasing the size of the flowers so that many crosses now boast flowers larger than two inches, and the Japanese are coming to Santa Barbara to buy epis. to take back to Japan! We continue to strive towards reduce the size of the plants with a height approximately 18-24 inches when mature. If we could create a cold hardy cultivar with all our trademark attributes of flower quality, it would be a bright day indeed, but in the meantime, it is hard to compete with the beauty of these plants and their majestic clusters of flowers that continue to flower for months and months. Today, Cal-Orchid is known as the "EpiCenter". Full exploration of the history andproduction of our 'Pacific Line' of reedstem epidendrums can be found published by the Orchid Digest and American Orchid Society magazines. Temperature-- Though the original epidendrum hybrids were quite cold hardy, this modern style (with the introduction of Epi. cinnabarinum for shape) requires somewhat warmer temperatures. We grow ours with 60-65 degree nights in the summer and let the night temperatures fall to around 55 degrees in the winter. This is important as it helps shorten the plant habit. They are quite robust and tolerate 80-85 degrees easily in the summer. If you are growing outdoors, you will see stress in the leaves and damage to the flowers when temps. drop to 40 and below. Best to protect them at that point. Light-- This is one of the most important criteria for growing epidendrums well. They require high light throughout the year. It should be equal to or slightly more than that given to cattleyas. Plants are growing their best when there is a slight red tint to the leaves. If the light level is too low, the plants will become elongated, weak and flower poorly. Humidity and Air Movement-- Just a moderate level of humidity, fifty percent, is sufficient. We often see these plants grown outdoors under much drier conditions than we would have thought optimal. Nice air movement is beneficial as always, and can help to prevent any kind of leaf spotting. Water and Fertilizer-- Epidendrums love an ample supply of water in the growing season as they are very fast growers and need sufficient hydration to build new tissue. Water every 5-7 days throughout the spring and summer growing season. Considerably less water is required in the fall and winter months. Water every 7-10 days at that point, allowing the plant to almost dry out between waterings. Just remember that epidendrums are quite heavy feeders when they are in active growth, and make sure you provide a strong solution of fertilizer, nearly every watering, during this period. A low nitrogen fertilizer is sufficient throughout the flowering season. Potting-- Our mix consists of medium fir bark, a little larger fine bark and perlite. Any course media will work fine. For those who grow outdoors in warmer climates, a porous inorganic media works great. Potting should be done in the late spring/early summer, when new roots start to emerge.At this point you can slightly crop back your plants to shape them for an attractive look. We have never seen plants enjoy new mix more than epidendrums.